In February 2016, my team and I have were inspired to collaborate with some the most reputable vendors in Los Angeles to throw a Berry Beautiful inspired wedding shoot. I received an inquiry from Wedding Nature Photography, and with their reputation for being the best photographers and being published in over 7 most popular wedding blogs, there was no way I could pass up the opportunity to partner with them. When Iness from Wedding Nature Photography first inquired about the shoot, she keenly described to have the photo-shoot that represented the unique side of Los Angeles, California that would inspire brides and grooms all over the world to choose for their wedding destination. So I chose, Malibu Rocky Oaks. As a passionate traveler, I was very aware that people from all over the world visioned Los Angeles, California to have, 1. The Hollywood Sign, 2. Palm Trees, and 3. The Beach. But, I wanted to introduce the world to see the other incredible elements Los Angeles has to offer. Again, that’s why I chose Malibu Rocky Oaks. The venue is the perfect destination to shine a new light to Los Angeles, California. The venue overlooks acres of vineyards, and brings to you the world of our grand mountain tops. Our cinematographer, Marc Chester Weddings did an incredible job to capturing exactly that. Don’t believe me? Watch the first few seconds of the clip below and see for yourself! He not only captured the beautiful surroundings of the venue space, but every detail and intimate moments of our couple. We teamed up with FlorUnique for the event design. 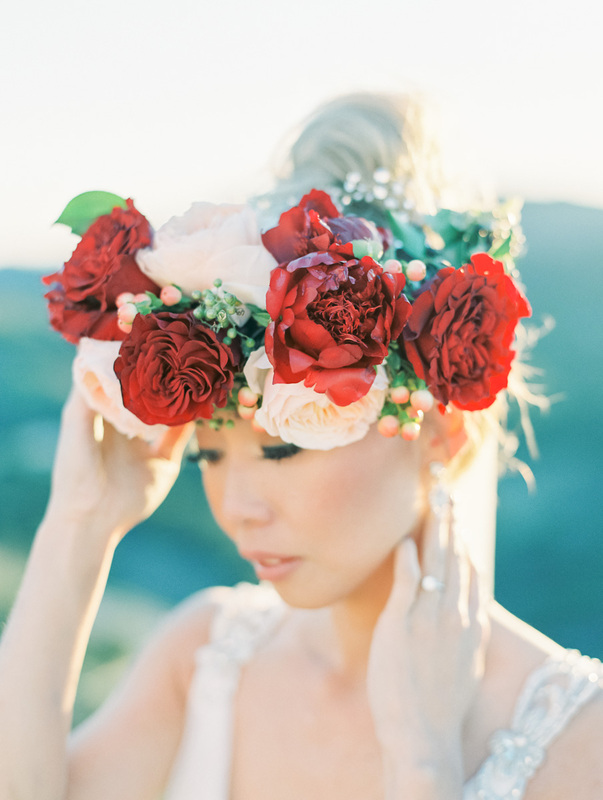 Needless to say, Winnie at FlorUnique provides a unique floral design, and we knew her exotic twists to all of her floral decor would be perfect for our very different styled shoot. Together we managed to set the tone for the intricate details in a wedding ceremony and reception design. Prior to the day-of production, we asked Winnie from FlorUnique to create lush, green and romantic garlands—full of greenery and roses with hues of reds, pink and violets! Ask and you shall receive people! We asked, and Winnie brought it to the table! Why have linen runners when we can make our own with flowers, right?! Following the garland and floral pieces, we surrounded the centerpiece by combining golden mercury vases, succulent pomander balls and REAL bunches of grapes to bring out that luxury-Tuscany look. With gold flatware, gold rimmed wine goblets provided by MTB Rentals, old & laced place mats, with a pop of color from our plum and blueberry colored leaf chargers, purchased from Z Gallerie, the table setting was truly out-of-this-world. We then finished the gold plates that laid perfectly on top of the chargers with mini Moscow mule shot glasses that we also purchased from Z Gallerie, and filled each one with fresh grapes, raspberries and blackberries. When we mean details matter, they definitely matter! Your guests will notice the smallest details in your table decor! Hanging over the dream-like tablescape reception decor were romantic chandeliers. The details meant everything to us. We can’t wait to collaborate with our partners again to create our next unique photo-shoot! Stay tuned rock stars ;)!